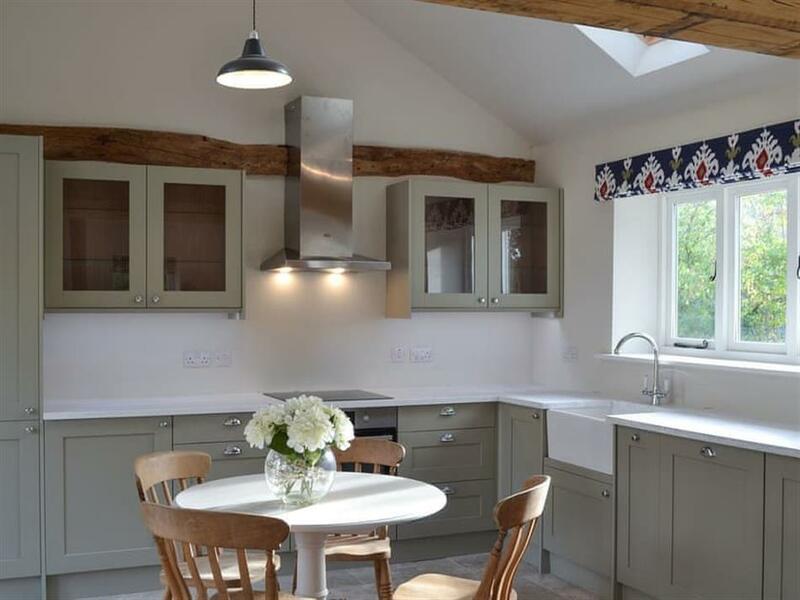 Barley Cottage in Beauworth, near Alresford , Hampshire sleeps 4 people. 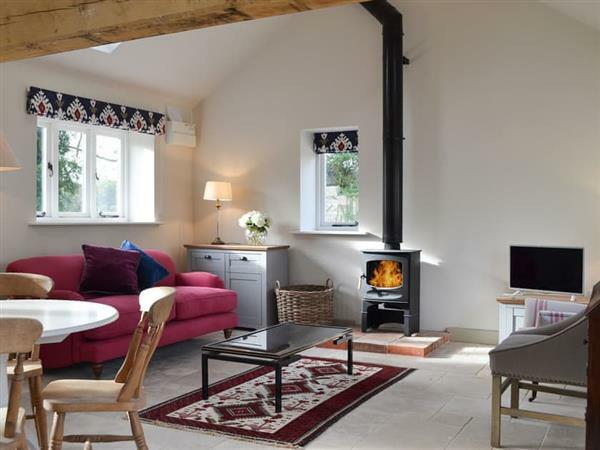 Barley Cottage near Alresford is a detached single-storey barn conversion which has some lovely features, such as an open plan living space, complete with a high vaulted, beamed ceiling, a wood burner and tiled floor. It is located along a lane, within the owner’s farm buildings and part of a working farm. Presented to a very high standard throughout, this tastefully furnished property is conveniently located for Alresford, Winchester, Petersfield and the Itchen and Meon Valley - ideal for couples or families wishing to explore the many attractions and walks in this lovely part of Hampshire. One small, well-behaved dog is welcome, but must be kept on a lead outside of the property as the local fields have sheep and livestock. There are good places and walking routes to drive to that are very dog friendly – including some of the local pubs! Nearby Cheriton has a village shop and there are two well-known local pubs within 2 miles, both serving good food. The popular quaint Georgian town of Alresford is about 3 miles away, and has scenic riverside walks, further eateries, inns, tea rooms, boutiques and shops. Why not take a step back in time on the Mid Hants Watercress Steam Railway! Alresford is also known for being the UK capital of watercress farming. There are so many places to visit for keen walkers and cyclists in the area, including the Itchen Way, South Downs Way, Wayfarers Way, St Catherine’s Hill, Winnall Moors Nature Reserve and also the Ox Drove cycle track linking the South Downs National Park. There are many good golf clubs in the area, the nearest being Alresford, and excellent trout or coarse fishing in the Meon and Itchen Valley. Ideal for those wishing to explore the area, as well as sightseeing attractions, the National Trust’s Hinton Ampner is only about a mile away and is popular with all ages. The property is within easy reach of the historic city of Winchester, 8 miles, with an ornate cathedral, museum, The Gurkha Museum, King Alfred’s Statue and the Winchester Science Centre and Planetarium. There are beer and wine tours and tastings within the area too. Just a short drive leads to the market towns of Alton and Petersfield, and Southampton and Portsmouth are worth a visit with the Spinnaker Tower, day trips to the Isle of Wight by ferry, shopping outlets and historic dockyards with ships. It is less than 45 minutes’ drive to the nearest beach at Hayling Island, and about 60 minutes’ drive to the wonderful sandy beach at West Wittering. Also within easy driving distance are Chichester with Goodwood or Fontwell races, Jane Austen’s House, Gilbert White’s House and Gardens, Hambledon Vineyard, The New Forest, Marwell Zoo, Paultons Park with Peppa Pig World and Queen Elizabeth Country Park. The shop, pub and restaurant are all 1½ miles from Barley Cottage near Alresford. Open plan living space: With beams, tiled floor and vaulted ceiling. Living area: With wood burner, Freeview TV with Netflix and French doors leading to courtyard. Bedroom 1: With king-size bed and en-suite toilet. Oil central heating, electricity, bed linen, towels, superfast fibre broadband and logs for wood burner included. Cot and highchair available on request. Welcome pack. Enclosed courtyard with garden furniture and barbecue. 1 small dog welcome, to be kept on a lead at all times (working farm). Private parking for 2 cars. No smoking or e-cigarettes. Holidays at Barley Cottage run from Monday to Monday. Pets allowed at Barley Cottage. Barley Cottage is in Hampshire; should you be on the lookout for a special offer, you can find all the special offers in Hampshire. It's always worth checking to see what is on offer at the moment. Do you want to holiday near Barley Cottage (UKC3847), you can see other cottages within 25 miles of Barley Cottage; have a look to find your perfect holiday location.